Cristal Antique will exhibit a light yellow-green hue which is darker at the edge. 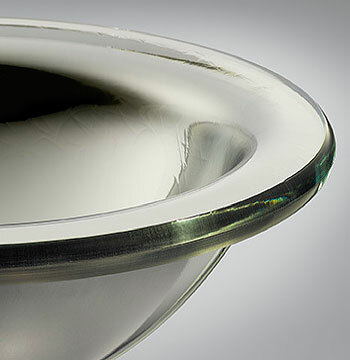 The surface of the glass shows a light, random linear texture which is less obvious on the bent surfaces of the basin and countersink products due to heat forming. Contact factory for CounterTops over 72"(1800mm). This drawn glass may exhibit irregularities and imperfections due to the manufacturing process of the raw material and is not offered on CounterSink products. Mirror is only translucent on light glass colors. Dark colors will not show light transmission on vanity, drop-in or Pullman installations. Refer to the Color & Finish guide for recommended use on individual products.